The Royal Air Force operate three operational squadrons of the Chinook HC Mk2. 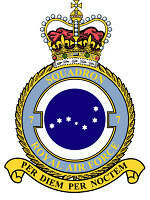 No 7,18, and 27 squadrons operate from RAF Odiham in Hampshire. One Chinook, with air and ground crews from Nos 7, 18 and 27 Squadrons is also operated from Mount Pleasant in the Falkland Islands on support helicopter tasks. 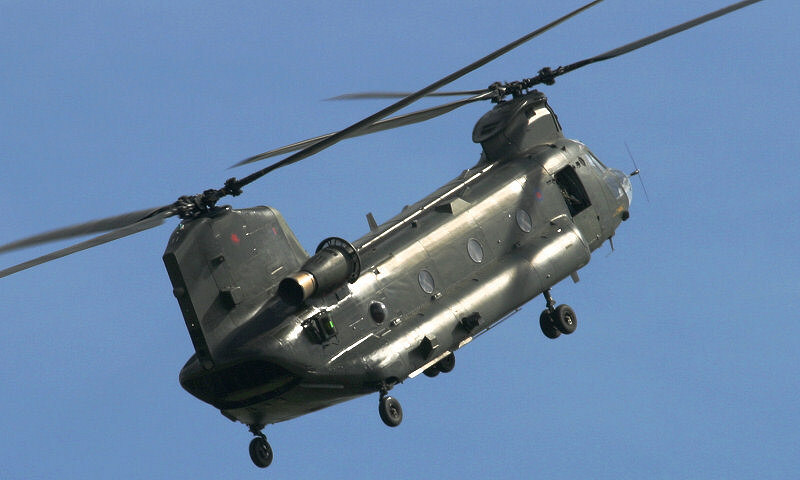 Chinooks are used primarily for trooping and for load carrying (both internal and underslung) and can carry up to 54 troops or 10 tonnes of freight. The cabin is large enough to accommodate two Land Rovers, while the three underslung load hooks allow a huge flexibility in the type and number of loads that can be carried. Secondary roles include Search and Rescue and Casualty Evacuation (a total of 24 stretchers can be carried). The crew consists of either two pilots, or a pilot and navigator, and two Air Loadmasters. The aircraft can be armed with two M-134 six-barrelled Miniguns and an M-60 machine gun. RAF Chinook HC2 at RAF Cosford 2005. Motto: Per diem, per noctem - By day and by night. Badge: On a hurt, seven mullets of six points forming a representation of the constellation Ursa Major - approved by King George VI in June 1939. Battle Honours: Western Front 1915-1918, Ypres 1915, Loos, Somme 1916, Ypres 1917, Fortress Europe 1941-1944, Biscay Ports 1941-1944, Ruhr 1942-1945, German Ports 1942-1945, Berlin 1943-1945, France and Germany 1944-1945, Normandy 1944, Rhine, Kosovo, Iraq 2003*. Motto: Animo et fide - 'With courage and faith'. 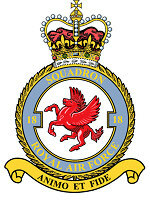 Badge: Pegasus rampant - approved by King Edward VIII in May 1936. The Pegasus commemorated the unit's co-operation with the Cavalry Corps on the Somme during World War I. Battle Honours: Western Front 1915-1918*, Somme 1916*, Somme 1918*, Hindenburg Line*, Lys, France and Low Countries, Invasion Ports 1940*, Fortress Europe 1940-1942, Channel and North Sea 1940-1941*, Egypt and Libya 1942, North Africa 1942-1943*, Mediterranean 1943, Sicily 1943, Salerno, South East Europe 1943-1944, Italy 1943-1945*, Gothic Line, South Atlantic 1982*, Gulf 1991. Motto: Quam celerrime ad astra - 'With all speed to the Stars'. Badge: An elephant - approved by HM King Edward VIII in October 1936. 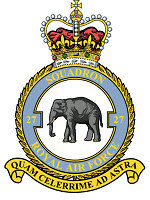 The badge was based on an unofficial emblem first used in 1934 and commemorates the Squadron's first operational aircraft - the Martinsyde G100 'Elephant' - and the unit's long sojourn to India. 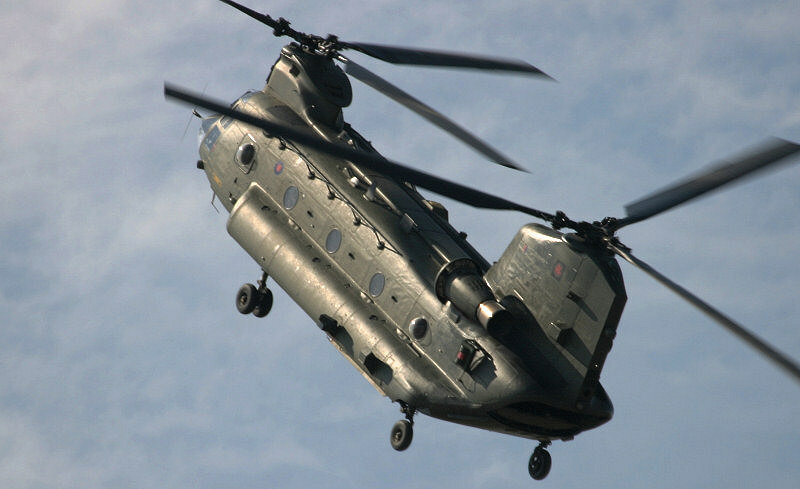 This year is the 25th anniversary of Chinook ops at RAF Odiham. 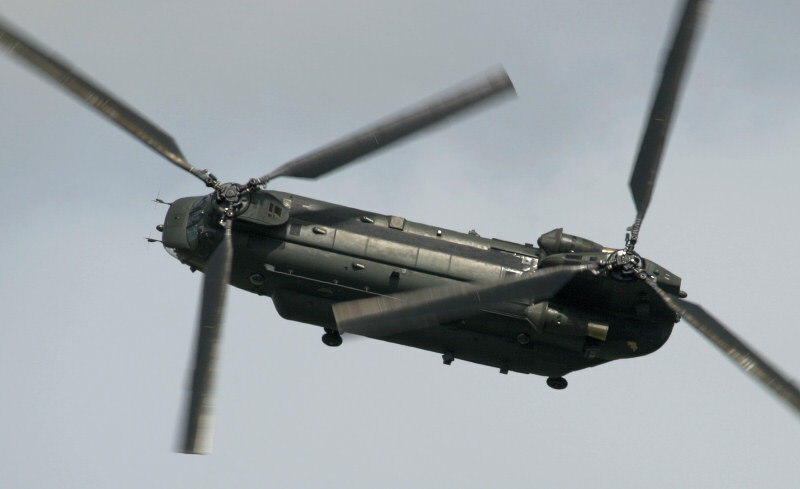 The 2006 Chinook Display Team will feature 2 captains due to overwhelming demand for the award winning display. Flt Lts Ollie Whyatt and Rich Batey, both from 18 Sqn, RAF Odiham, will head-up the crews. Co-pilots are Flt Lt Chris Middleton, and Flt Lt Adam Watts. Crewmen are FS Jamie Dunkerley, FS Sam Norris , and Sgt Stuart Logan. The Chinook Display will participate in all of the major UK shows. Flt Lt Richard Batey joined the RAF in 1990 as a direct entrant cadet and started RAFC Cranwell in 1990. Following officer training he conducted flying training at RAF Linton on Ouse and RAF Valley before commencing Multi engine training at RAF Finningley. Following streaming he was posted to 24 Sqn to fly the Hercules where he completed a co-pilots tour operating across the globe in both the Air transport and Air to Air Refueling Role. After completion of this tour he changed roles and completed rotary training at RAF Shawbury in 1997. Following streaming he was posted to the Chinook at RAF Odiham. Since arrival he has served on both 18 and 27 Sqn and been involved in operations in all theatres of the world including Bosnia, Kosovo, The Falkland Is and Iraq and completed the Qualified Helicopter Tactics Instructors course in 2002. In 2005 he was posted to RAF Shawbury and completed the Qualified Helicopter Instructors before returning to RAF Odiham to take up a post as an Operational Conversion Unit instructor. In total Flt Lt Batey has amassed about 3500 hours with over 1500 on the Chinook. RAF Chinook HC Mk2 at the Royal International Air Tattoo 2005. Flt Lt Oliver Whyatt joined the RAF in 1988 as a university cadet and started RAFC Cranwell in 1989. Following officer training he conducted flying training at RAF Church Fenton and RAF Valley before commencing rotary training at RAF Shawbury in Aug 1992. Following streaming to remain flying the Wessex he was posted on his first operational tour to 72 Sqn in Northern Ireland. A brief stint as the 3 Brigade Air Liaison Officer preceded a short tour to 60 Sqn at RAF Benson before returning for his second operational tour in Northern Ireland in April 1997. In January 1999 he was posted to Headquarters 16 Air Assault Brigade at Colchester helping to plan and conduct exercises and operations worldwide for the 5000 strong Brigade. 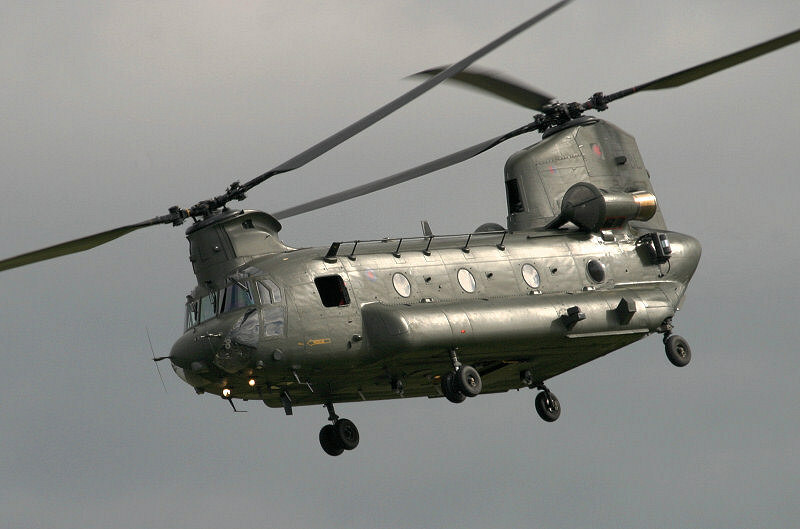 In January 2001 he was posted to RAF Odiham to convert to the Chinook and joined 27 Sqn in September 2001. Early the following year he was involved in war fighting operations in Afghanistan and in 2003 war fighting operations in Iraq. Posted to 18 Sqn in September 2004 after yet another tour of duty in Iraq he was the display copilot last season before being selected to display the Chinook this season. In total Flt Lt Whyatt has amassed about 3500 hours with over 1000 on the Chinook. Flt Lt Chris Middleton is 34 years old and was born in Inverness. Whilst attending the University of Glasgow he became a member of the University Air Squadron before joining the RAF in 1995. He commenced navigator training in 1996 and 2 DHFS ME at RAF Shawbury in 1998 before entering the Chinook OCU in 1999. During his time on Chinooks he has been a member of all 3 Squadrons. Recently returned from Operations in Afghanistan, he has also spent time on Operations in Iraq, Bosnia, Turkey and Northern Ireland. RAF Chinook HC2 at RIAT 2005. Flt Lt Watts is originally from Kirkcudbright in Dumfries and Galloway. Whilst attending the University of Glasgow he became a member of the University Air Squadron before joining the RAF in 2000. Following his commissioning in 2001 he was posted to the DHFS at RAF Shawbury. 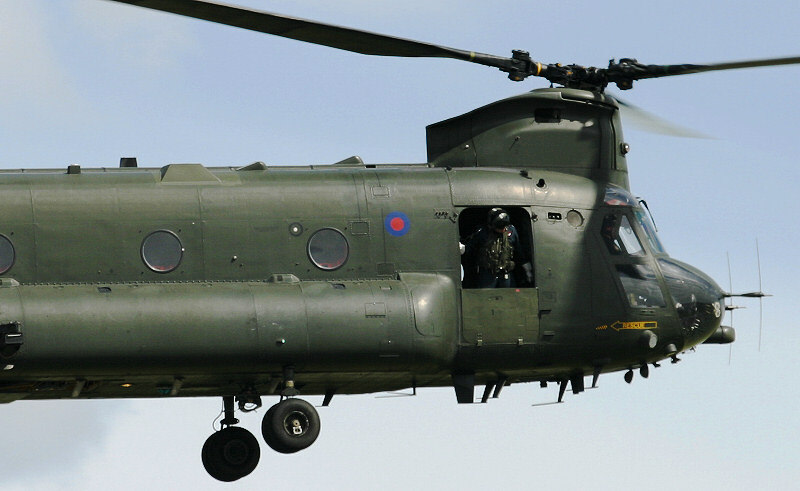 In 2002 Flt Lt Watts was selected to attend 18 Squadron's Chinook OCF at RAF Odiham before beginning his operational career in 2003 with B Flt 27 Squadron. Since then he has completed detachments in Iraq, the Falkland Islands, Northern Ireland as well as taking part in Op MATURIN, the UK's contribution to aid relief in the earthquake hit region of Kashmir in Pakistan. FS Dunkerley joined the RAF in 1987. After basic military training he started his Aircrew training at RAF Finningley. Moving to RAF Shawbury, he completed his basic rotary training and was posted to 240 Operational Conversion Unit at RAF Odiham. 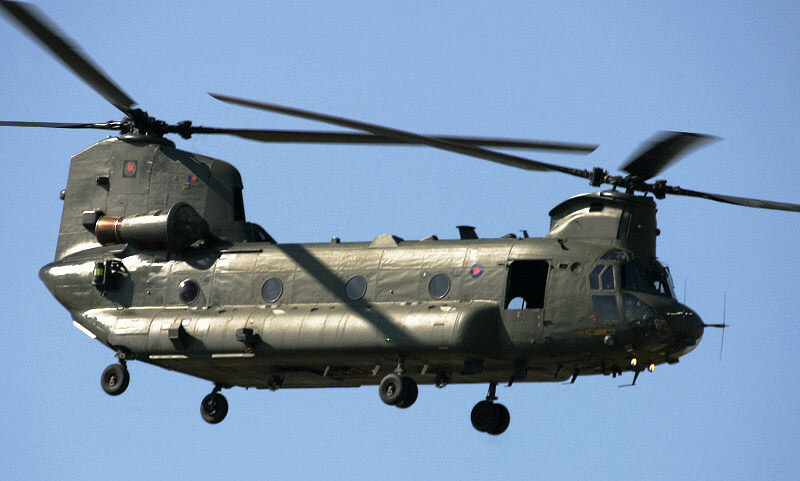 After completing the Chinook OCU, he was posted to No 18 Sqn, RAF Gutersloh in 1989. He deployed to the Middle East, taking part in Operation Granby, the first of his two Gulf Wars. From 18 Sqn, he moved to No 7 Sqn at RAF Odiham in 1992. In 1998 he was selected for instructor training and returned to 18 Sqn. Deploying on Operation TELIC to Iraq in 2002, he has also operated in many other theatres. He has over 4500 Chinook hours. FS Norris joined the RAF in Aug 1999. Previously, he served 25 years in the Royal Navy; initially as a submariner and from 1983, as a Search and Rescue diver/crewman. He has over 2000 hours Wessex and Seaking and has participated in more than 300 rescues. He completed No 15 Chinook course in May 2000 and was posted to 18 (B) Sqn. He has since flown 1300 hours and operated in diverse places such as Norway, Sierra Leone, Morocco and Iraq. He is currently the crewman Standards Officer. Sgt Stuart Logan joined the RAF as an Air Loadmaster in January 2001. On completion of basic loadmaster training at RAF Cranwell he carried out advanced flying training on the Griffin helicopter at RAF Shawbury. He was posted to the Chinook wing at RAF Odiham in February 2003 and is currently an Air Gunnery Instructor on 27 Squadron with over 1000 hours Chinook. Sgt Logan has operated in a variety of UK based exercises as well as having completed tours in Iraq and most recently Afghanistan. RAF Chinook HC2 at Waddington 2005. Thanks to Sqn Ldr Dave Morgan and the rest of 'Team Chinook'.